Textiles made of synthetic fibres and blends have a large share of the Chinese market. Consequently, solutions for processing these base materials are in high demand. 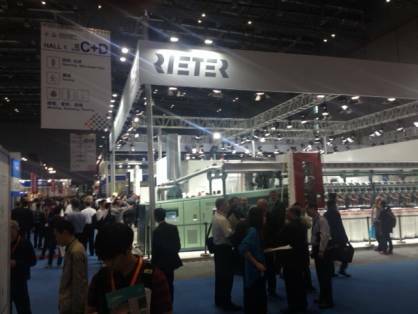 At the textile machinery trade fair ITMA Asia 2016 in Shanghai (21-25 October) Rieter therefore shone the spotlight on relevant offerings. The company showed their products and service innovations for complete systems, spinning preparation and the end spinning process under the Rieter, Bräcker, Graf, Novibra and Suessen brands. Rieter gave visitors to the exhibition information about the comprehensive portfolio of the after sales services, about components for the economic manufacture of high-quality yarns as well as the extended SPIDERweb mill control for the optimal use of the spinning mill. The solutions presented made a big impact on trade fair visitors. In particular, the new single-head RSB-D 50 draw frame generation, which offers hitherto unattained productivity combined with the highest quality, struck a chord. It enables up to 33 % higher delivery speed with significantly lower energy consumption. The J 26 air-jet spinning machine, which is a much-improved version of the previous model and debuted for the first time in China, also enjoyed greater attention. This machine is offered as a solution for processing viscose, combed cotton and blends. It enables a wide range of yarn to be produced economically. Numerous people from China, neighbouring Asiatic countries and other markets visited the Rieter stand. We at Rieter were able to conduct many interesting and fruitful conversations with our guests. We would like to tender our heartfelt thanks to our customers and everyone who visited Rieter at ITMA 2016.